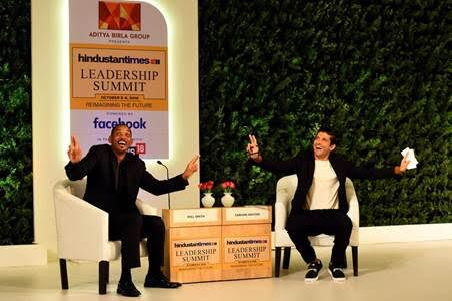 The very multi-talented Farhan Akhtar who has won hearts over with his acting, directing and singing skills, recently took centre stage at the Hindustan Times Leadership Summit 2018 in Delhi with Hollywood star Will Smith. The star who is known for his versatility had a fun chat Will Smith as he convinced him to shake a leg with him on a Bollywood track, sending all the fans in a frenzy. At the summit, Farhan Akhtar and Will Smith candidly indulged in a heart-felt conversation about childhood, struggle as an artiste, dealing with failure. Will Smith also revealed how he set the goals for himself to be the best movie star in the world, inspiring so many others through his journey. The Hollywood actor who felt at-ease with Farhan Akhtar, also cheekily expressed that performing a Bollywood dance sequence has been one of the top things on his bucket list. He was kind enough to give us a teaser of it, when he willingly demonstrated his sick moves on stage. He also expressed a wish to do a film with Aishwarya Rai Bachchan, whom he met 15 years ago. Farhan Akhtar recently took to his Instagram and shared a post where they are seen grooving to some Bhangra beats. On the work front, Farhan Akhtar is in the process of launching his first international album, Echoes. The first song of the album, Rearview Mirror, is already out and has garnered appreciation from everyone and the second song is anticipated to release in November. Will Smith will next be seen as Genie in the live-action remake of Disney’s Aladdin.